Before parades begin or when crowd size warrants, the New Orleans Police Department will close the route to vehicles. 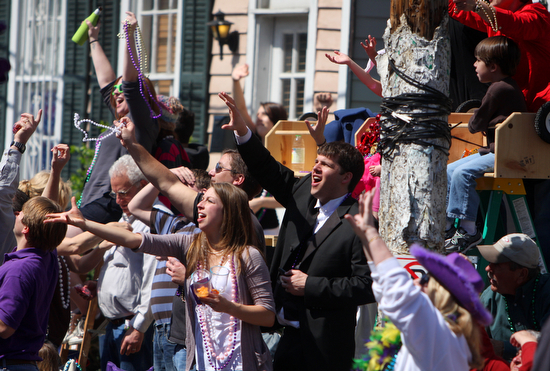 Keep track of the parade routes and times at routewise.nola.gov. Those who don’t have a bicycle can use a Blue Bike from the city’s bike share program. Parade-goers need to remember not to lock their bike to parade barricades and to ask permission before locking to someone’s fence. If you’re taking public transportation, plan ahead with RTA’s Mardi Gras Guide. Download the GoMobile app to plan your trip, check service alerts, purchase fares, and track your bus or streetcar in real time. Service will be provided along the entire St. Charles Avenue route. However, buses will replace the streetcar from Canal Street to Valence Street about two hours before the first parade begins each day to allow parade goers access to the neutral ground. The Department of Public Works will be enforcing parking regulations throughout the Mardi Gras season. Residents are reminded to pay close attention to posted signs. More parking tips and information are available at ready.nola.gov. For parking enforcement, call 504-658-8100. That line is answered 24 hours a day. Parking is restricted along all parade routes two hours before and after parades to ensure parade elements and sanitation crews can access the street. Depending on the specific parade route, parking may be prohibited on either side of the following streets two hours before and after parades. Follow all posted signs.